Below is a timeline of events, pertinent to the Symposium topic, spanning more than 100 years from 1856 to 1968. Even though we are focusing on the 1940s and 1950s, events that occurred in the late 19th and early 20th centuries deeply influenced Rosa Parks. In his Bibliographical Notes on the last page of his book, Dr. Brinkley tells his readers there were three autobiographies Rosa Parks felt all Americans should read: 1) Up from Slavery by Booker T. Washington, published in 1901, 2) The Souls of Black Folk by W.E.B. Du Bois, published in 1903, and 3) The Autobiography of an Ex-Colored Man by James Weldon Johnson, published in 1927. The timeline below coalesced from reading Dr. Brinkley’s book, those three autobiographies, and Double Victory by Cheryl Mullenbach, providing context to the silent strength Rosa Parks summoned on Dec. 1, 1955 standing up for her civil rights, and civil rights for all African Americans, by sitting peacefully in her seat on a bus. Links to important supplemental material for some dates on the timeline are highlighted. Dive in and explore! 1860 | – Abraham Lincoln is elected president. 1863: Jan. 1 – President Lincoln issues the Emancipation Proclamation. 1865: April 14 – President Lincoln is assassinated at Ford’s Theatre. Dec. 6 – The 13th Amendment abolishing slavery is ratified. 1868: W.E.B. Du Bois is born. He is the first African American to earn a Ph.D. from Harvard University, a professor of history, and was one of the co-founders of the NAACP (National Association for the Advancement of Colored People) in 1909. 1868: The 14th Amendment is ratified declaring all people born in the United States, including former slaves, are citizens with equal protection under the law. 1870: The 15th Amendment to the U.S. Constitution is ratified declaring citizens of the United States cannot be denied the right to vote because of race, color, or previous condition of servitude. Iowa’s vote in favor of the Amendment on Feb. 3, 1870 provided for ratification, thus meeting the requirement that two-thirds of states had to vote in favor of the Amendment for it to be ratified. 1892: Homer Plessy, an African American, refuses to sit in a segregated (Jim Crow) car on a train. 1897: Booker T. Washington speaks at the dedication of the Shaw Memorial in Boston. The memorial depicts the Massachusetts 54th Colored Infantry, an African American regiment, as they marched out of Boston on May 28, 1863 to fight for the Union in the south. The Shaw Memorial, a bronze statue, was created by Augustus Saint-Gaudens (1848-1907) whose studio in New Hampshire is now a national park. Sgt. William Carney, a member of the 54th Regiment who fought in the July 18, 1863 Battle of Fort Wagner in South Carolina, was the first African American soldier awarded the Medal of Honor. He attended the 1897 dedication of the memorial. 1909: Edna Griffin, called the Rosa Park of Iowa, is born. 1909: NAACP (National Association for the Advancement of Colored People) is established. 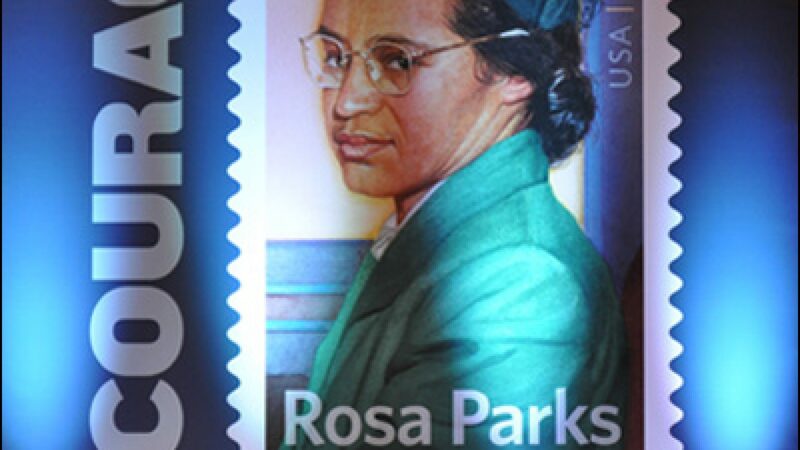 1913, Feb. 4: Rosa Parks is born in Tuskegee, Alabama. 1914-1918: World War I; African American officers train at Fort Des Moines in Iowa. 1915: Booker T. Washington dies. 1920: The 19th Amendment is ratified giving women the right to vote. 1929, Jan. 15: Martin Luther King, Jr. is born. 1946: Rosa Parks votes for the first time. 1948: Edna Griffin, who served as a WAC during WWII, is denied service at a lunch counter at Katz Drug Store in Des Moines, Iowa. She files a lawsuit against the store owner and wins her case. 1953: African-American bus boycott is held in Baton Rouge, Louisiana. 1954-1955: Brown vs. Board of Education ruled segregation in public schools based on race is unconstitutional and in doing so, unofficially overturned the Plessy vs. Ferguson decision. 1955: Rosa Parks refuses to give up her seat on a Montgomery, Alabama city bus. She is arrested and taken to jail. She is released within a couple of hours. The Montgomery Bus Boycott begins on Dec. 5 and lasts for 381 days. 1957: Rosa Parks and her husband Raymond move to Detroit, Michigan. Refer to Chapter 10 in Rosa Parks: A Life. 1962: John Glenn, a NASA astronaut, becomes the first American to orbit the Earth. Before launch, he asks for Katherine Johnson to check the math again on his trajectory. 1963: August 27 – W.E.B. Du Bois dies. August 28 – The March on Washington for Jobs and Freedom is held. Dr. Martin Luther King delivers his “I Have A Dream” speech, now one of the most famous speeches in American history. Nov. 22 – President John F. Kennedy is assassinated in Dallas, Texas. 1964: Jan. 23 – The Twenty-Fourth Amendment to the U.S. Constitution is ratified declaring poll taxes unconstitutional. July 2 – The Civil Rights Act of 1964 is signed into law by President Lyndon B. Johnson. 1965: The Voting Rights Act of 1965 becomes law. 1968: Dr. Martin Luther King, Jr. is assassinated in Memphis, Tennessee. 1969: Neil Armstrong, a NASA astronaut, becomes the first human to land on the moon.